Your prayers are a powerful part of our ministry. Thank you for Praying!!! Just a quick newsletter to let you know that we are doing awesome! The missions team from Colorado, Celebration Ministry of Arts, is here and God is working during this week of extra ministry activities!!! BFF this last weekend was a whopping 42 people! We had to move the car out of our garage, and remove the doors between the garage and the kitchen to make room for everyone. It was an amazing time of fellowship and worship, with quite a few newcomers! Praise God!!! 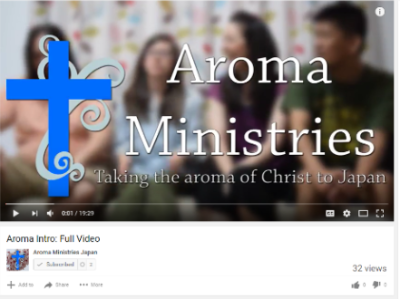 I am mostly sending out a newsletter to let you know about our new Aroma Ministries Japan YouTube channel and our first few video uploads. With the addition of Caleb to our team and all of his computer skills, we are going to able to take our internet presence and ministry through media to a whole new level! Praise God!!! Here is a direct link to an overview of most of the ministry that we are all involved in! In the weeks and months to come many of our newsletters will be video, instead of audio. And we are planning and dreaming about other media ministry opportunities. We appreciate your prayers for Caleb and the rest of us as we work on this area. And please continue to pray for summer ministry. This weekend is our children's dance workshop and BFF concert outreach on Saturday. Then we go to camp with the Seinan Jo Gakuin Jr. and Sr. High School girls. Finally at the end of the month Texas Team arrives!!! Pray for health and stamina and for Jesus to move in BIG ways!!! Many many blessings from Japan! The team at Aroma Ministries wants to extend a hearty 'thanks y'all and arigato' to all of our wonderful supporters. You help us spread the Aroma of Christ in Japan! Many blessings on you and let us hear from you, please let us know how we can be praying for YOU too. Copyright © 2016 Aroma Ministries, All rights reserved.